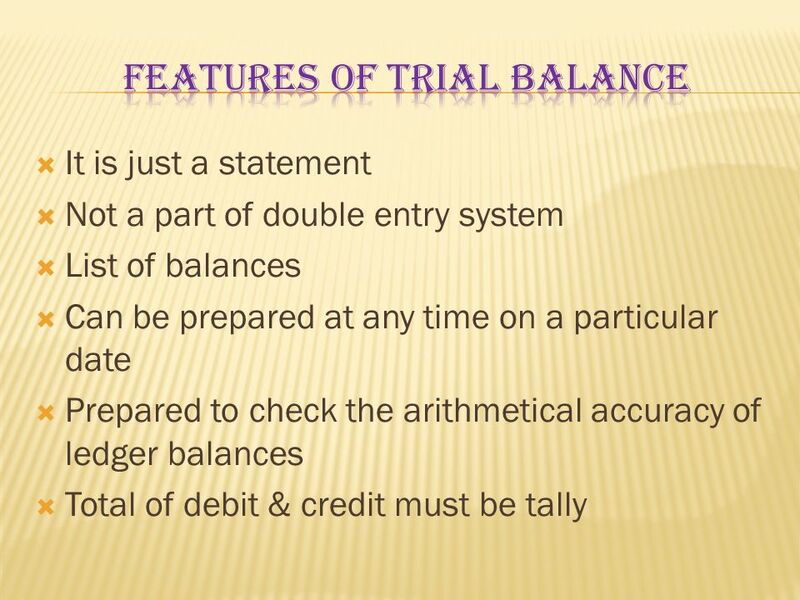 3 TRIAL BALANCE Trial balance is a statement & list of debit and credit balances, taken out from ledger , it also includes the balances of cash and bank taken from cash book to test the arithmetical accuracy of the books. 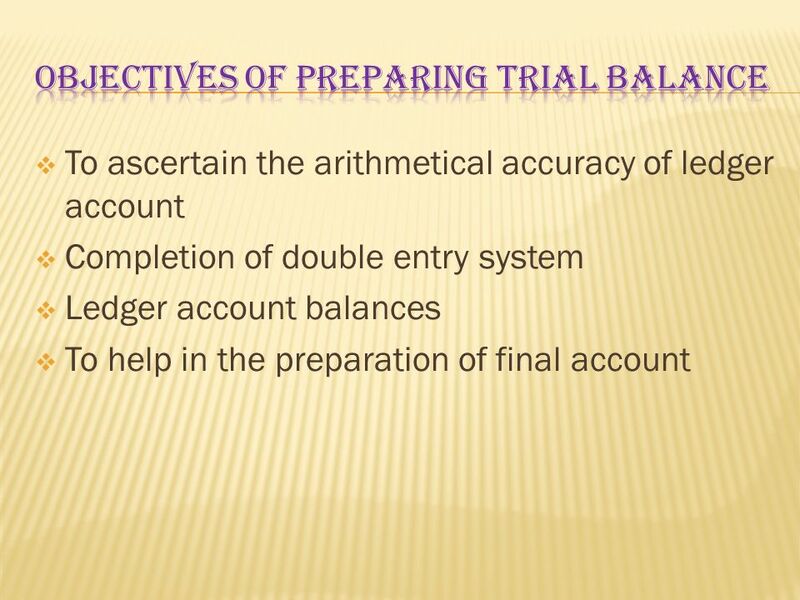 9 Performa of trial balance The most common format in which we find a trial balance is as below. 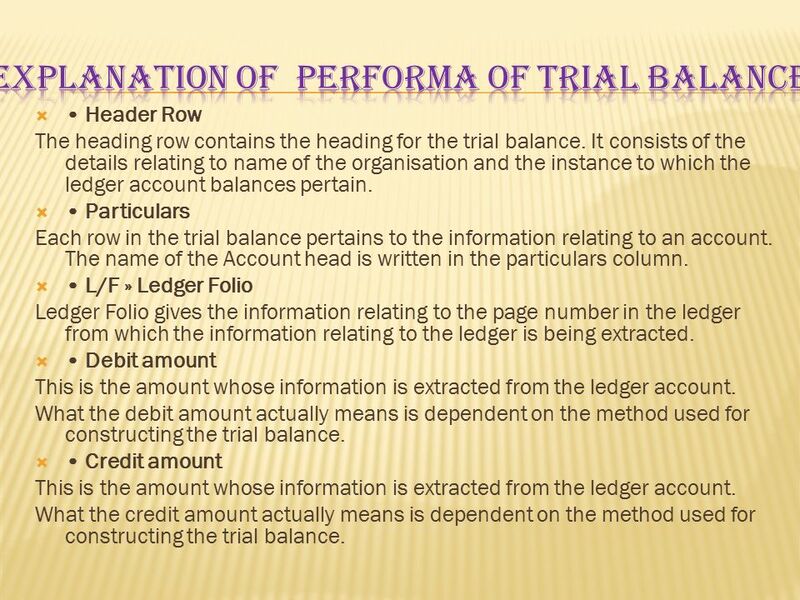 • Header Row The heading row contains the heading for the trial balance. It consists of the details relating to name of the organisation and the instance to which the ledger account balances pertain. 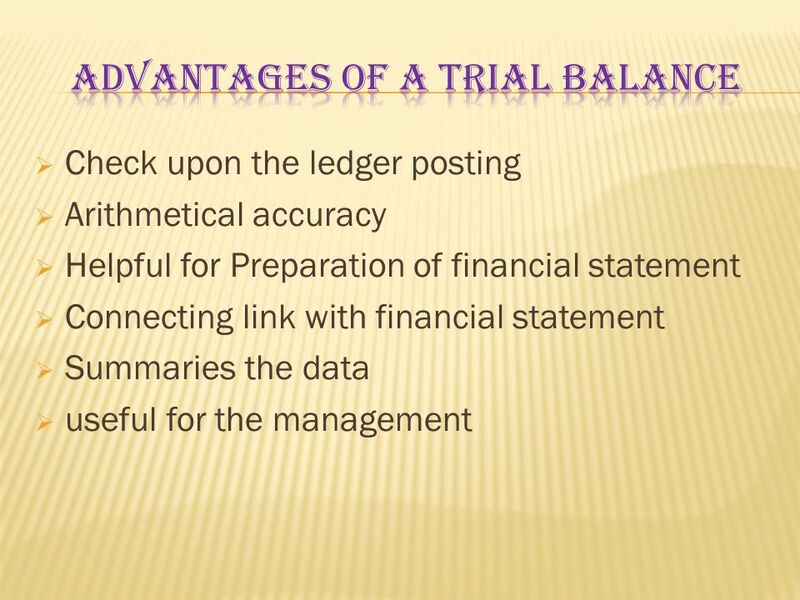 • Particulars Each row in the trial balance pertains to the information relating to an account. The name of the Account head is written in the particulars column. • L/F » Ledger Folio Ledger Folio gives the information relating to the page number in the ledger from which the information relating to the ledger is being extracted. • Debit amount This is the amount whose information is extracted from the ledger account. 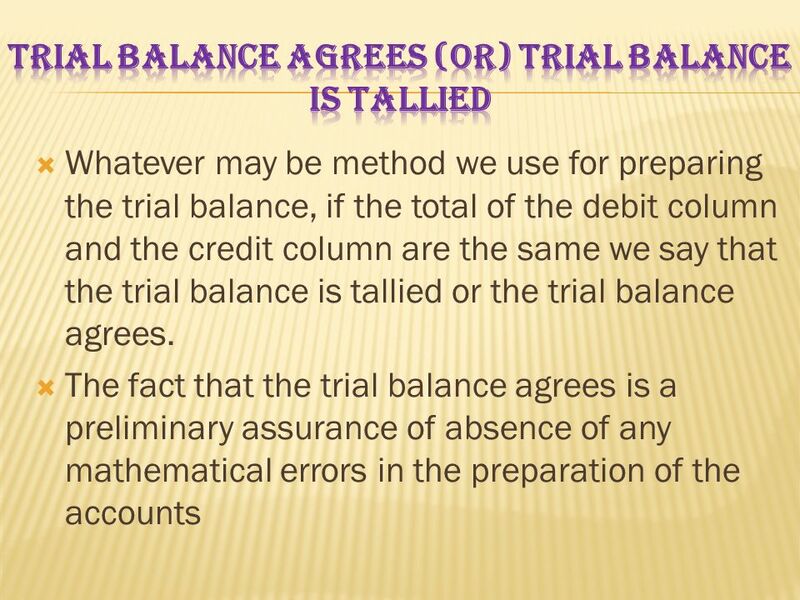 What the debit amount actually means is dependent on the method used for constructing the trial balance. 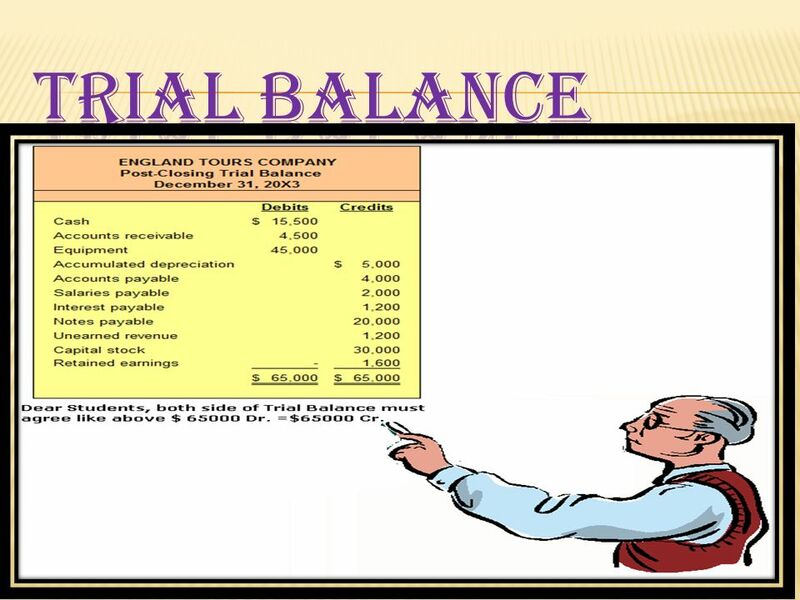 • Credit amount What the credit amount actually means is dependent on the method used for constructing the trial balance. 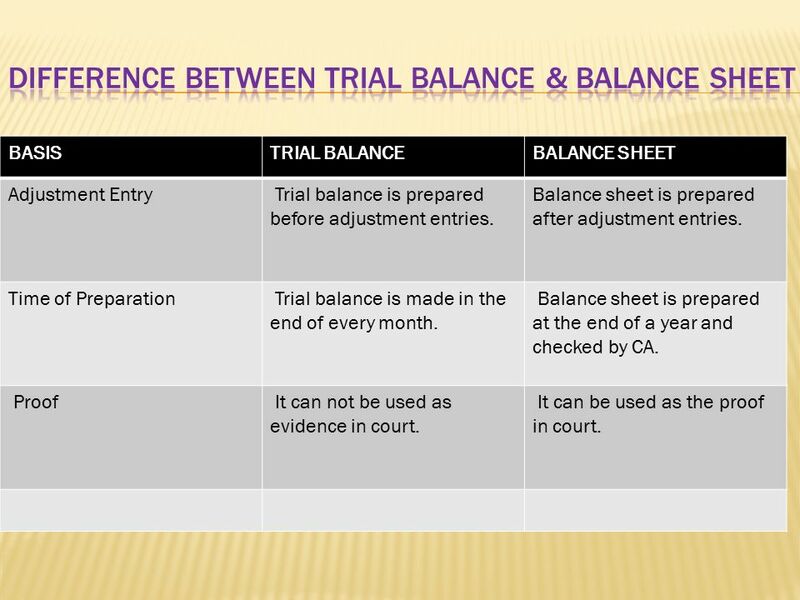 BASIS TRIAL BALANCE BALANCE SHEET Adjustment Entry Trial balance is prepared before adjustment entries. 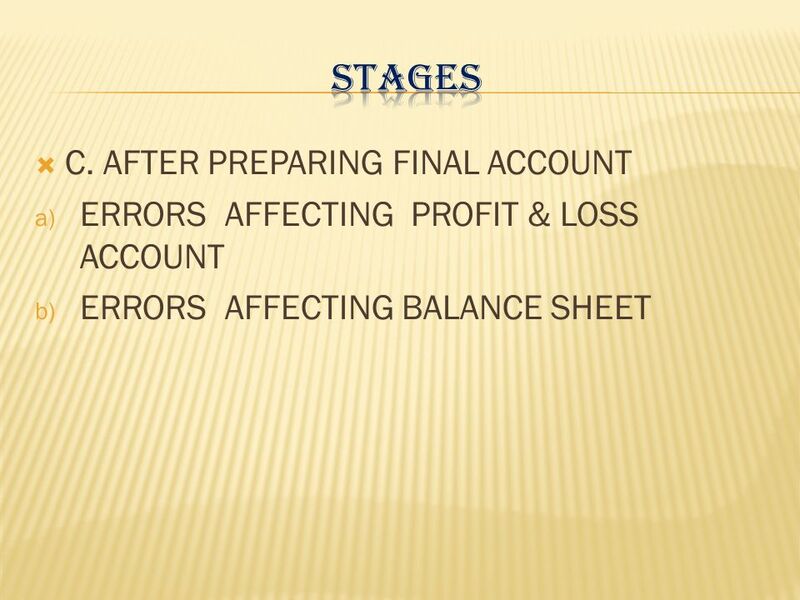 Balance sheet is prepared after adjustment entries. 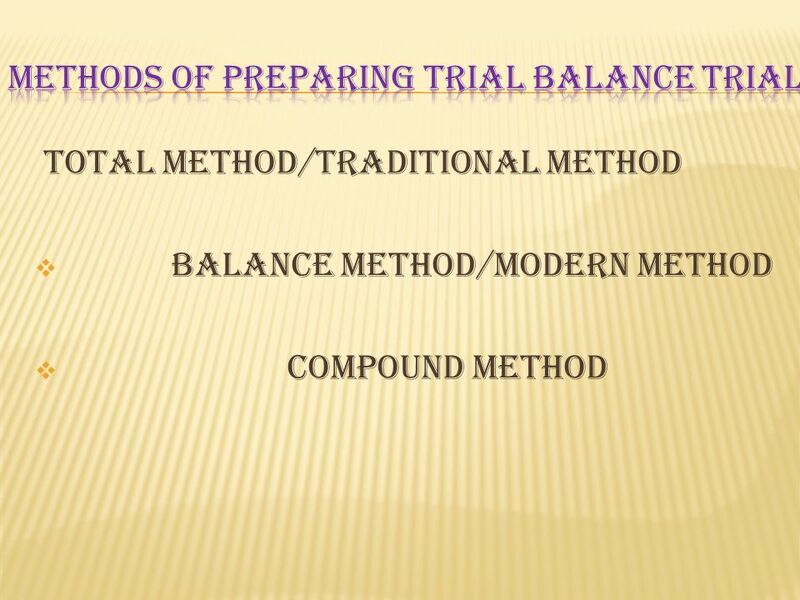 Time of Preparation Trial balance is made in the end of every month. Balance sheet is prepared at the end of a year and checked by CA. Proof It can not be used as evidence in court. It can be used as the proof in court. 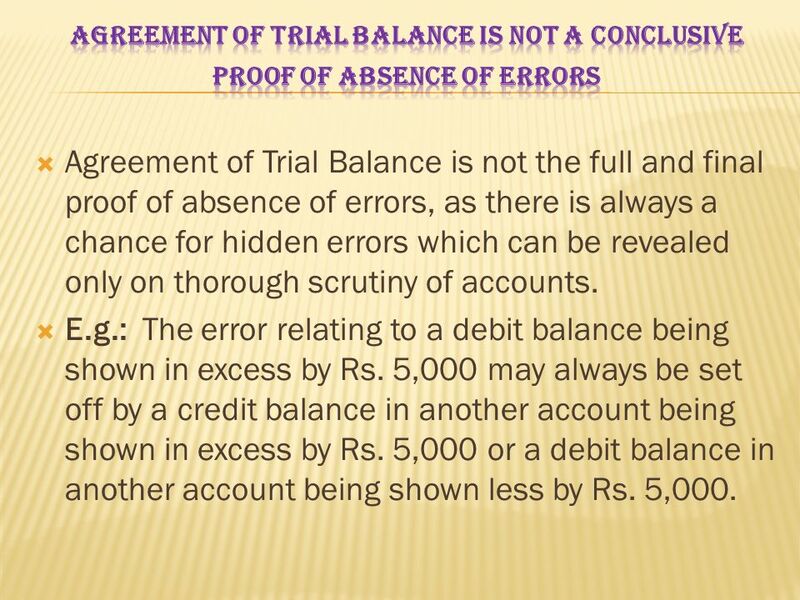 Agreement of Trial Balance is not the full and final proof of absence of errors, as there is always a chance for hidden errors which can be revealed only on thorough scrutiny of accounts. E.g. 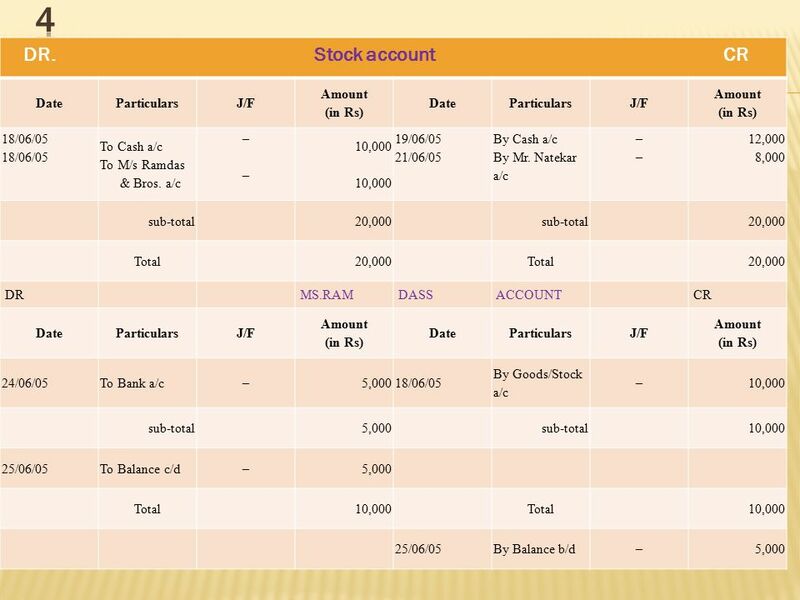 : The error relating to a debit balance being shown in excess by Rs. 5,000 may always be set off by a credit balance in another account being shown in excess by Rs. 5,000 or a debit balance in another account being shown less by Rs. 5,000. 24 error An error is a mistake. 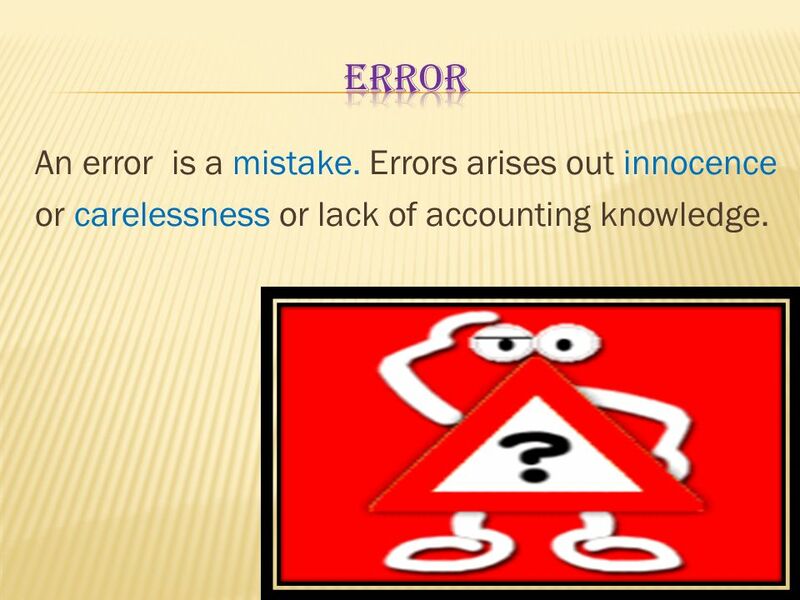 Errors arises out innocence or carelessness or lack of accounting knowledge. 1. 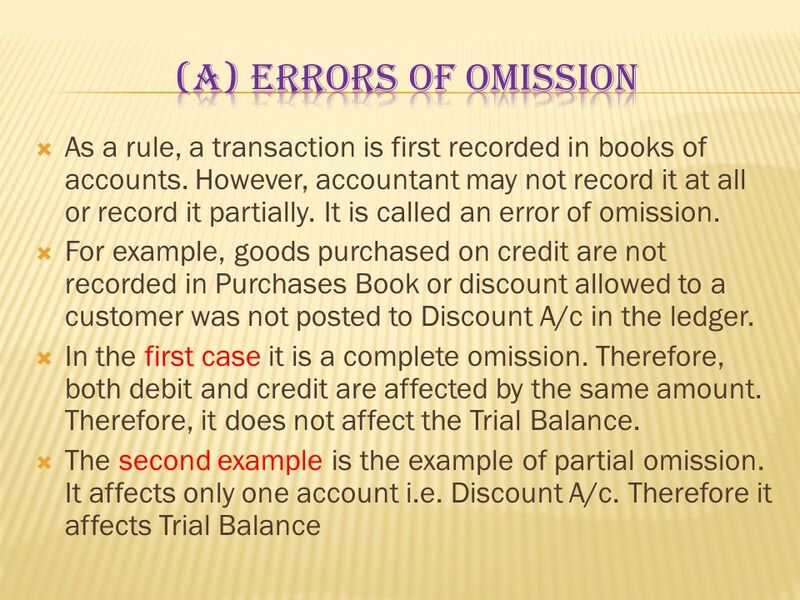 Errors of omission- no recording of transaction in the books of original entry 2. 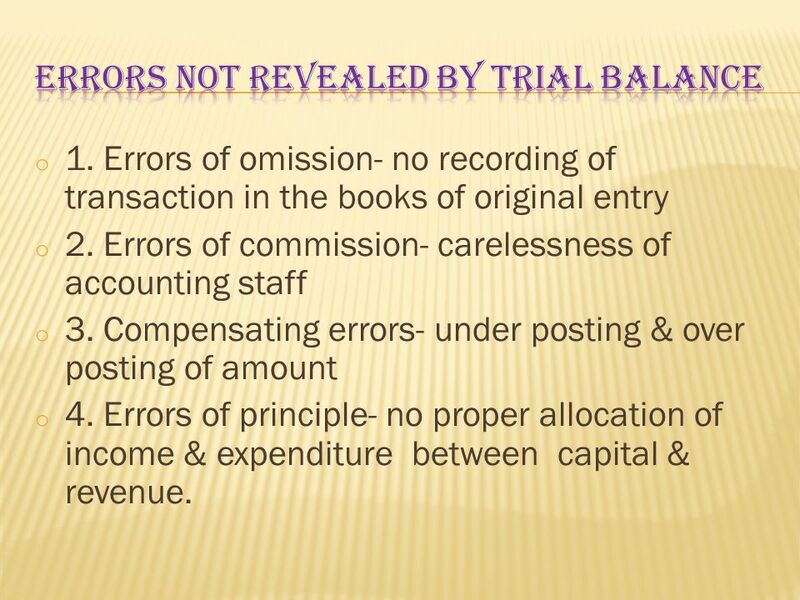 Errors of commission- carelessness of accounting staff 3. Compensating errors- under posting & over posting of amount 4. Errors of principle- no proper allocation of income & expenditure between capital & revenue. 32 (B) When the Trial Balance agrees. 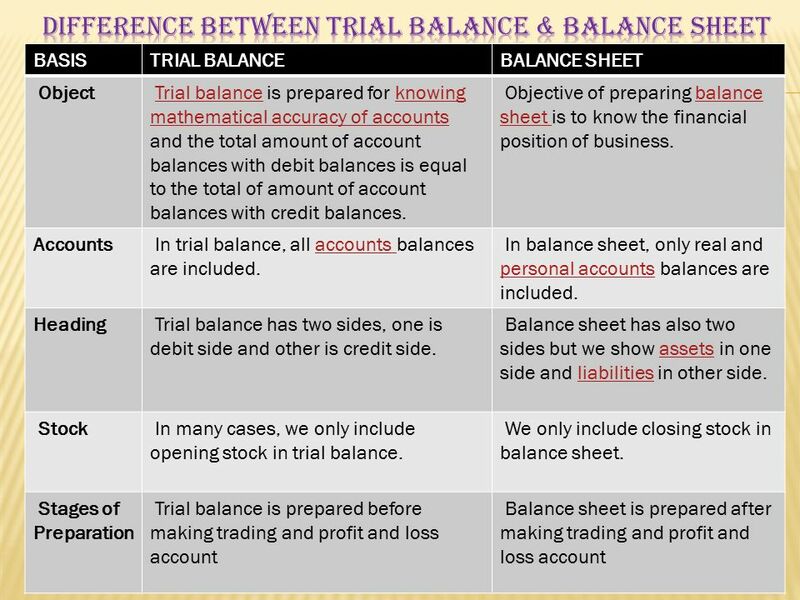 You have already learnt that if the totals of the two amount columns of trial balance tally it is no conclusive proof of the accuracy of accounts. There may still be some accounting errors. 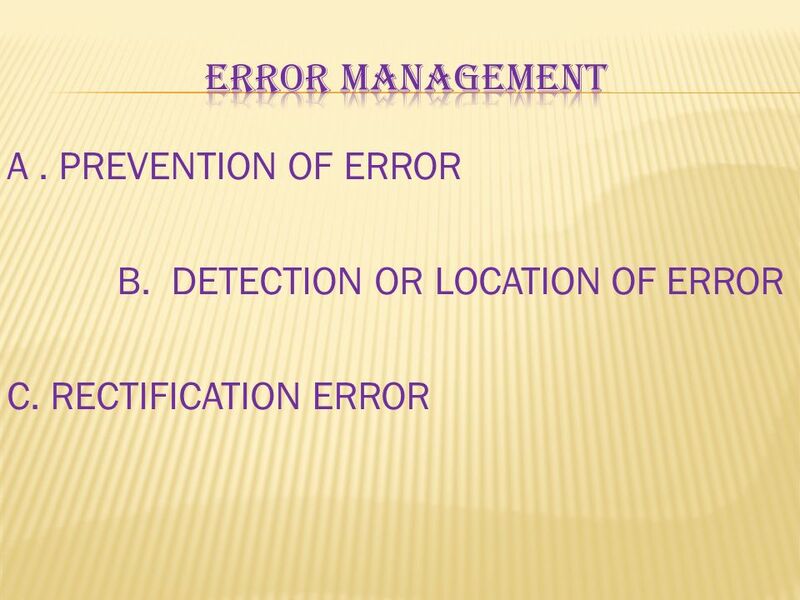 These errors may not be immediately traced but may be detected at much later stage. These are rectified as and when detected. 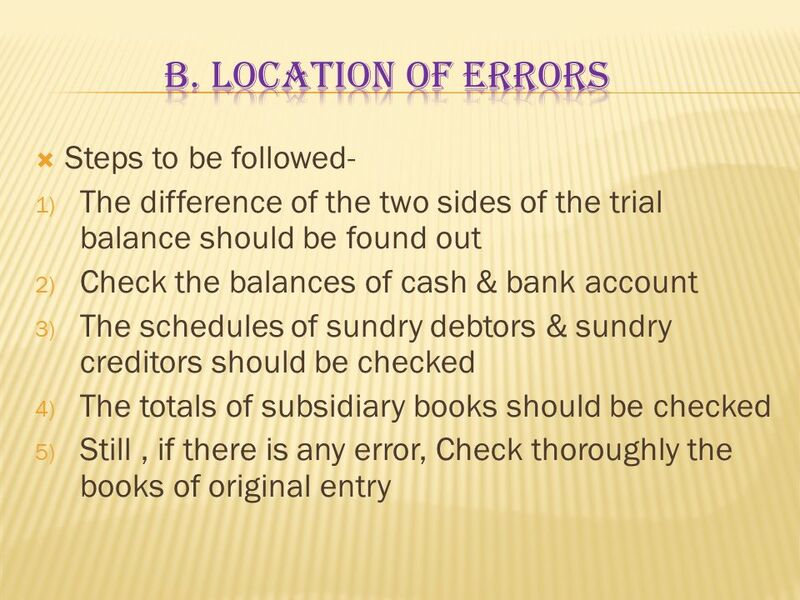 Following are the errors which don’t affect the trial balance : (i) Omission to record a transaction in a journal or in a Special Purpose Book. For example, goods purchased on credit but are not recorded in the Purchases Book at all. (ii) Recording a wrong amount of an item in journal or in a Special Purpose Book. For example, sale of Rs on credit entered in the Sales Book as Rs.5250. (iii) Posting the correct amount on the correct side but in wrong account. For example, cash received from Jagannathan was credited to Vishvanathan. (iv) An item of Capital Expenditure recorded as an item of Revenue Expenditure and vice-a-versa. For example, Repairs to Building was debited to Building A/c. Why does the trial balance still agree though there may be above stated errors? Reason is that in the above cases the debits and credits are affected simultaneously by the same amount. 33 Correction of Errors Error Correction Procedure Error Correction Procedure 1. 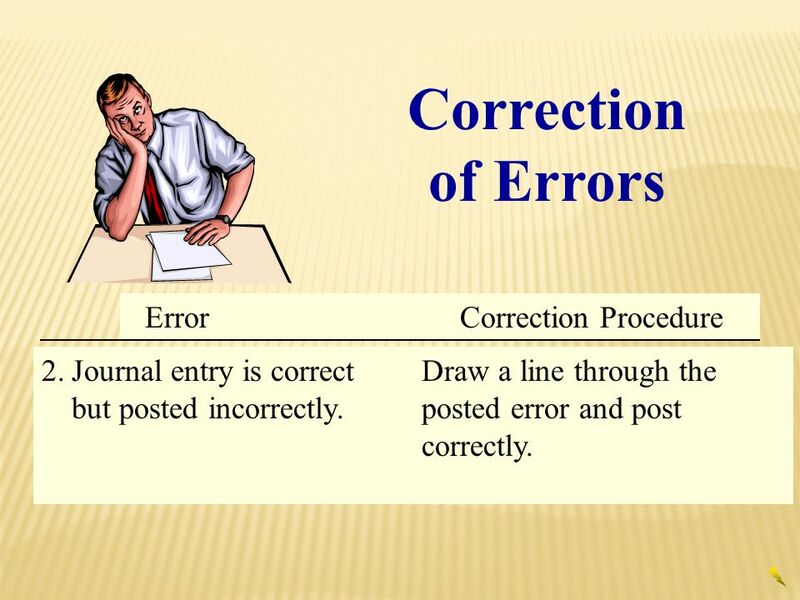 Journal entry is incorrect	Draw a line through the error but not posted. and insert correct title or amount. 34 Correction of Errors Error Correction Procedure Error Correction Procedure 1. Journal entry is incorrect	Draw a line through the error but not posted. and insert correct title or amount. 2. Journal entry is correct	Draw a line through the but posted incorrectly. posted error and post correctly. 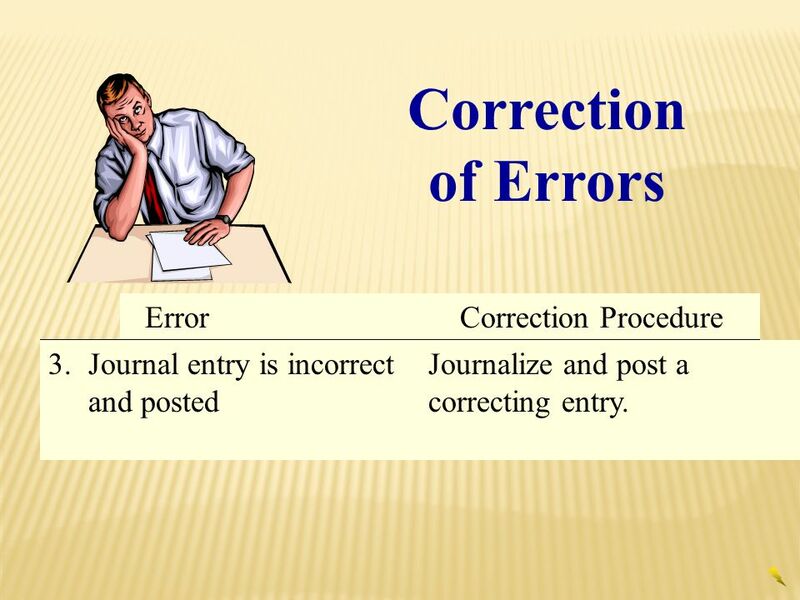 Error Correction Procedure Error Correction Procedure Journal entry is incorrect	Journalize and post a and posted	correcting entry. 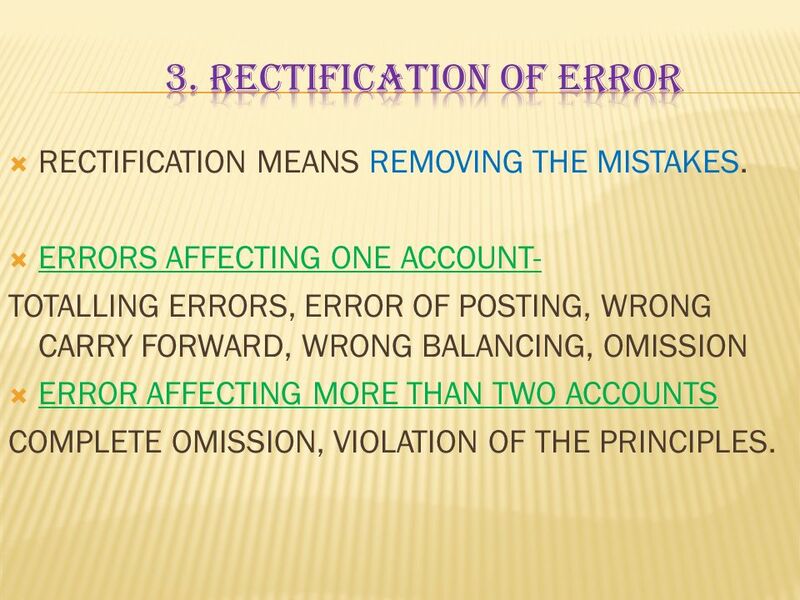 RECTIFICATION MEANS REMOVING THE MISTAKES. 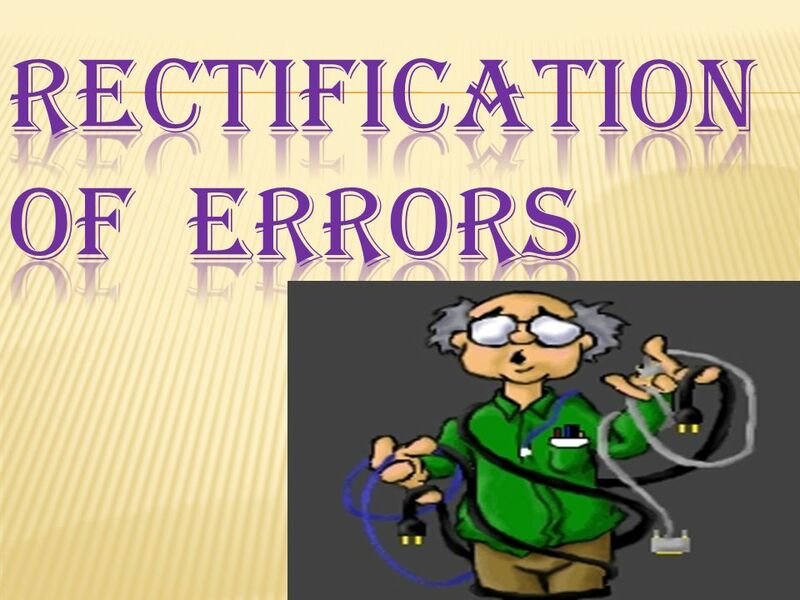 ERRORS AFFECTING ONE ACCOUNT- TOTALLING ERRORS, ERROR OF POSTING, WRONG CARRY FORWARD, WRONG BALANCING, OMISSION ERROR AFFECTING MORE THAN TWO ACCOUNTS COMPLETE OMISSION, VIOLATION OF THE PRINCIPLES. 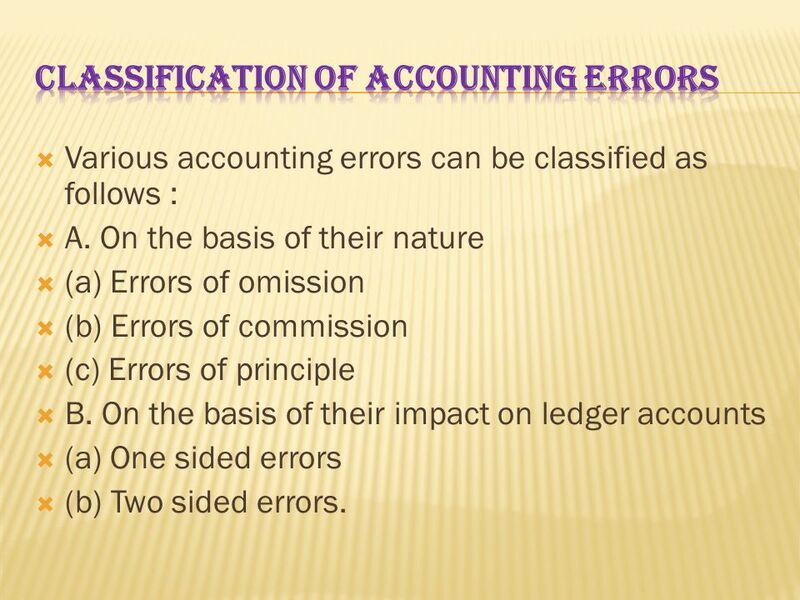 Various accounting errors can be classified as follows : A. On the basis of their nature (a) Errors of omission (b) Errors of commission (c) Errors of principle B. 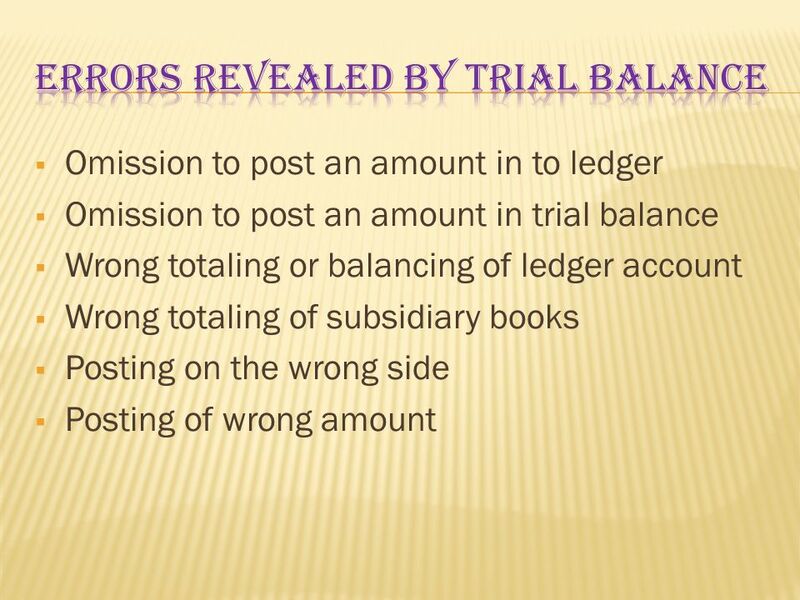 On the basis of their impact on ledger accounts (a) One sided errors (b) Two sided errors. When the transaction has been recorded but an error is committed in the process of recording, it is called an error of commission. 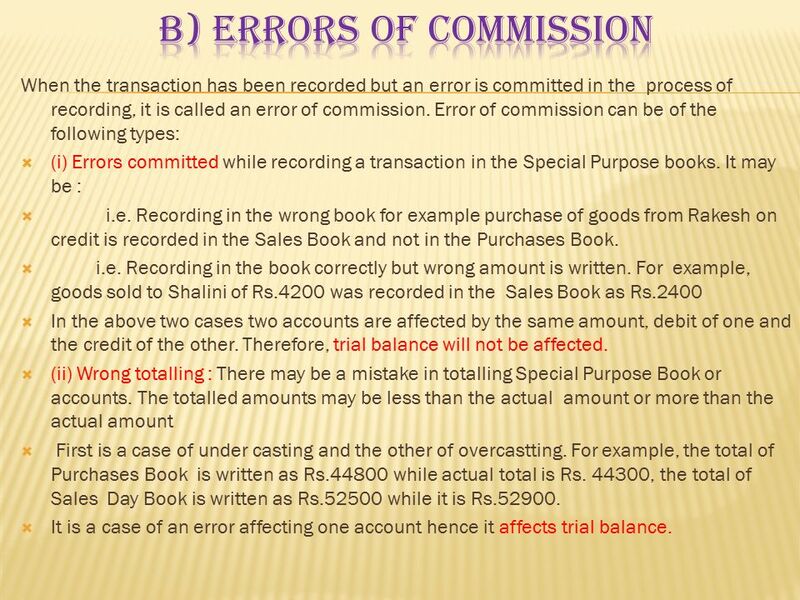 Error of commission can be of the following types: (i) Errors committed while recording a transaction in the Special Purpose books. It may be : i.e. Recording in the wrong book for example purchase of goods from Rakesh on credit is recorded in the Sales Book and not in the Purchases Book. i.e. Recording in the book correctly but wrong amount is written. For example, goods sold to Shalini of Rs.4200 was recorded in the Sales Book as Rs.2400 In the above two cases two accounts are affected by the same amount, debit of one and the credit of the other. Therefore, trial balance will not be affected. (ii) Wrong totalling : There may be a mistake in totalling Special Purpose Book or accounts. The totalled amounts may be less than the actual amount or more than the actual amount First is a case of under casting and the other of overcastting. 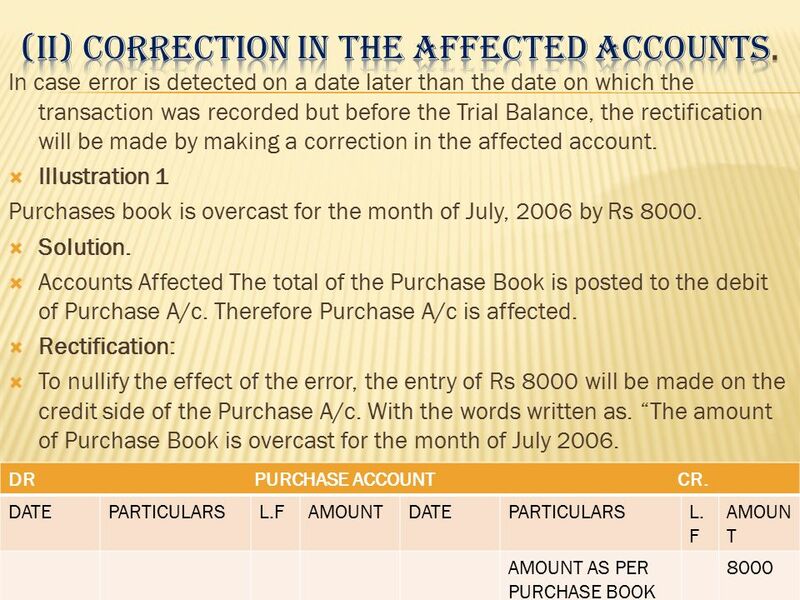 For example, the total of Purchases Book is written as Rs while actual total is Rs , the total of Sales Day Book is written as Rs while it is Rs It is a case of an error affecting one account hence it affects trial balance. 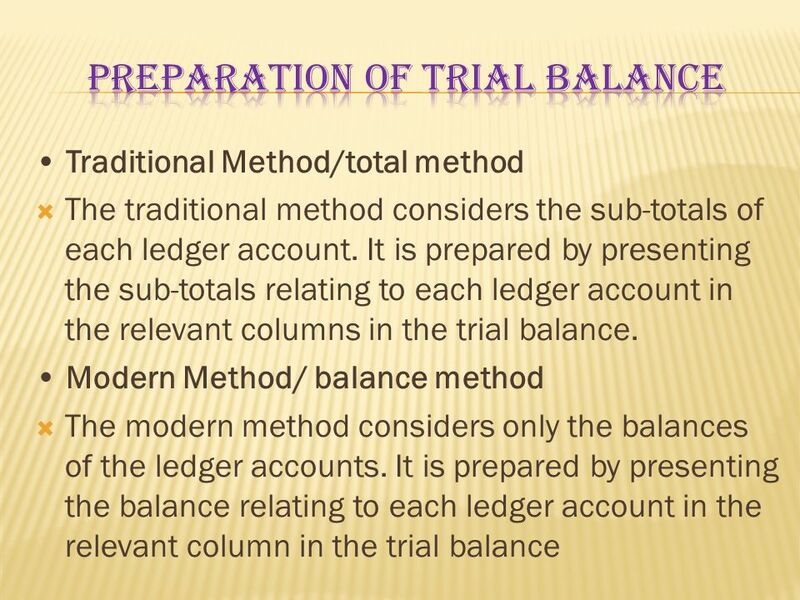 (iii) Wrong balancing : While closing the books of accounts at the end of the accounting period, the ledger accounts are balanced. 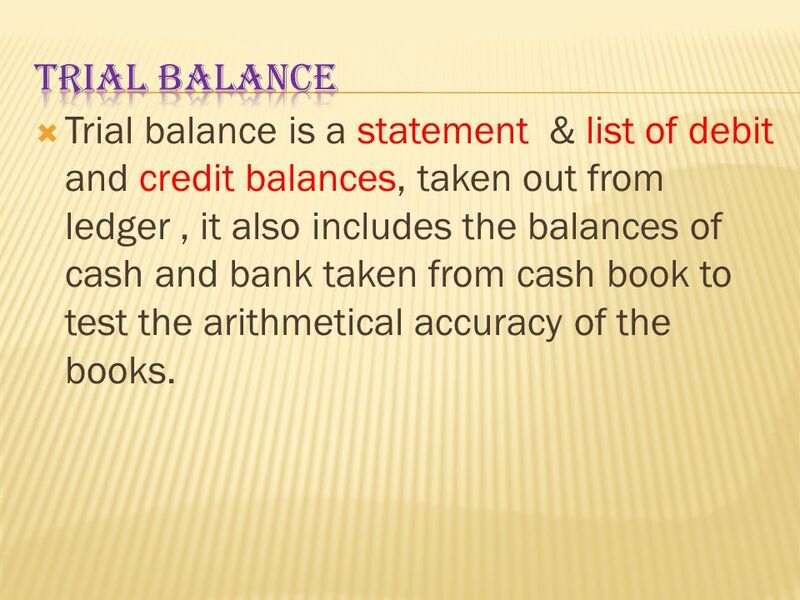 Balance is calculated of the totals of the two sides of the account. It may be wrongly calculated. 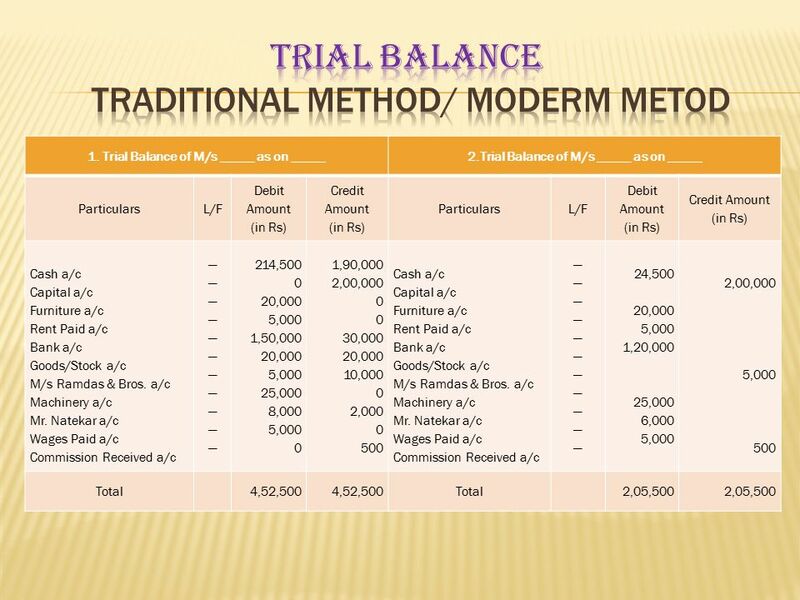 For example, the total of the debit column of Mohan’s A/c is Rs.8600 and that of credit column is Rs The balance calculated is as Rs.1600 while the actual balance is Rs It has affected one account only, therefore, the Trial Balance gets affected. 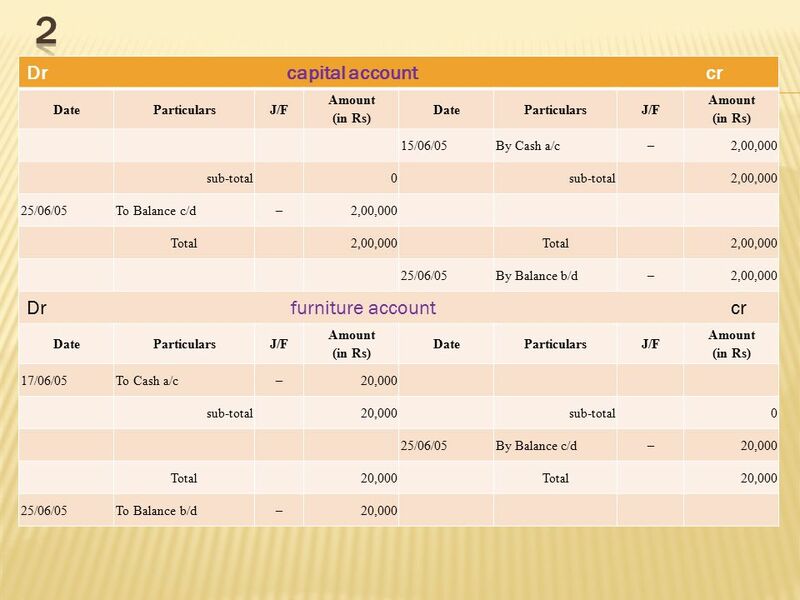 (iv) Wrong carry forward of balances or totals : Totals or balances are carried forward to the next page. These may be carried forward incorrectly. For example, the total of one page of the Purchases Book. 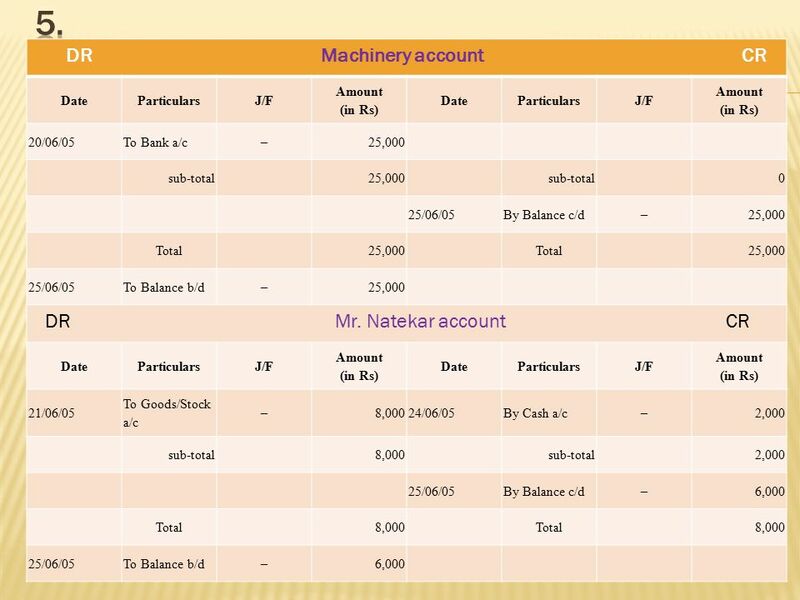 of Rs.35,600 is carried to next page as Rs Again the error affects one account only. 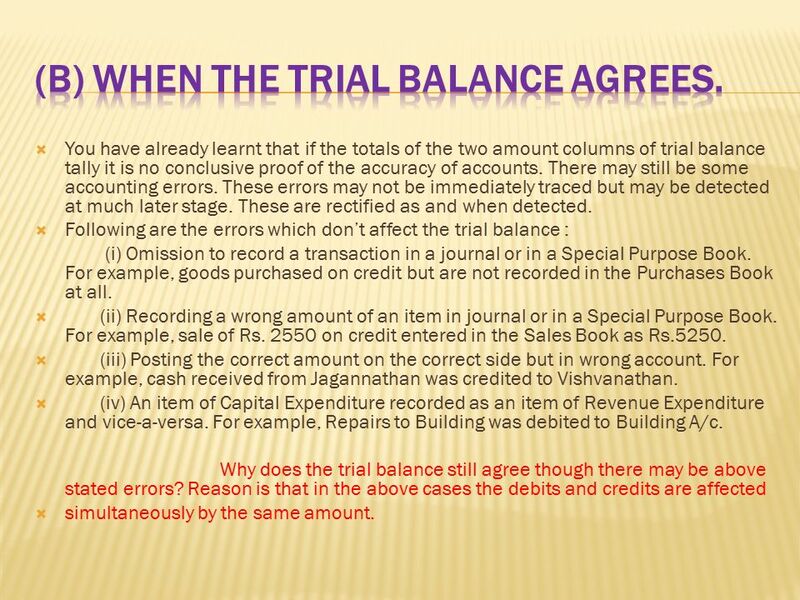 Therefore, Trial Balance gets affected. 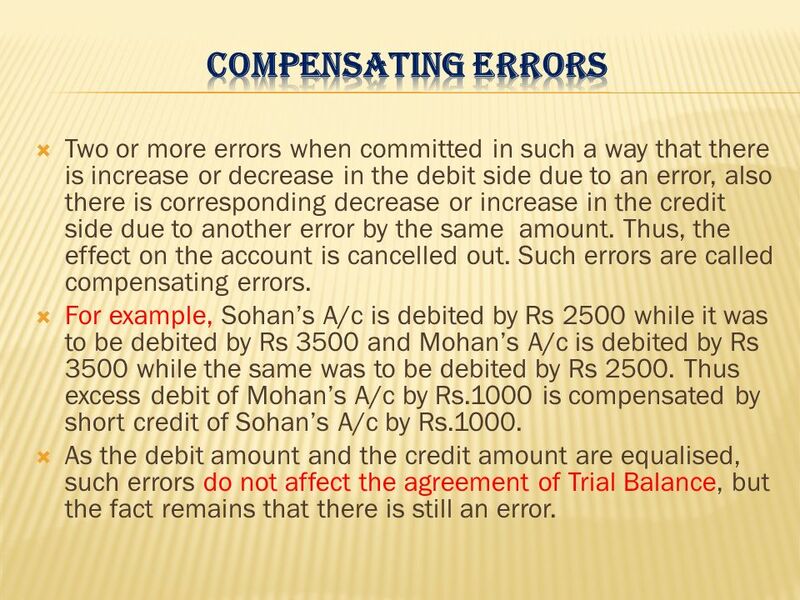 41 Compensating Errors Two or more errors when committed in such a way that there is increase or decrease in the debit side due to an error, also there is corresponding decrease or increase in the credit side due to another error by the same amount. Thus, the effect on the account is cancelled out. Such errors are called compensating errors. For example, Sohan’s A/c is debited by Rs 2500 while it was to be debited by Rs 3500 and Mohan’s A/c is debited by Rs 3500 while the same was to be debited by Rs Thus excess debit of Mohan’s A/c by Rs.1000 is compensated by short credit of Sohan’s A/c by Rs.1000. 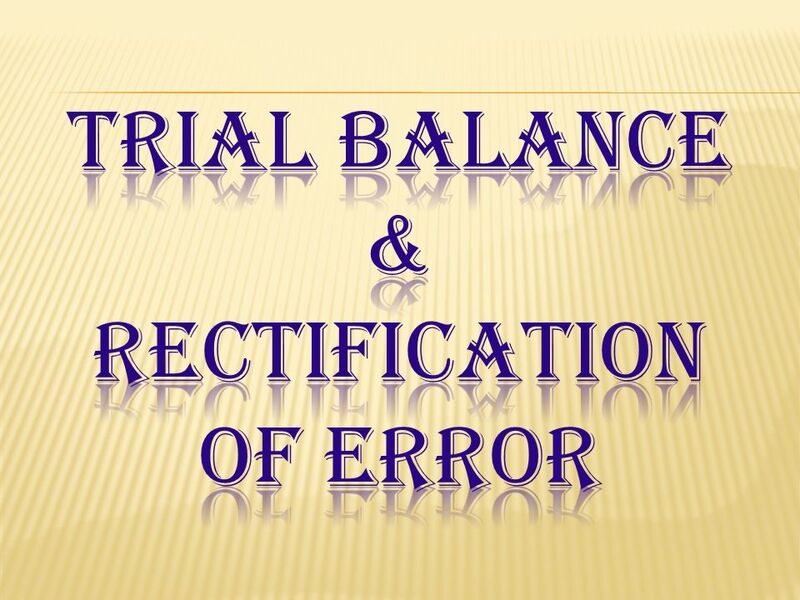 As the debit amount and the credit amount are equalised, such errors do not affect the agreement of Trial Balance, but the fact remains that there is still an error. Accounting errors that affect only one side of an account which may be either its debit side or credit side, is called one sided error. The reason of such error is that while posting a recorded transaction one account is correctly posted while the corresponding account is not correctly posted. 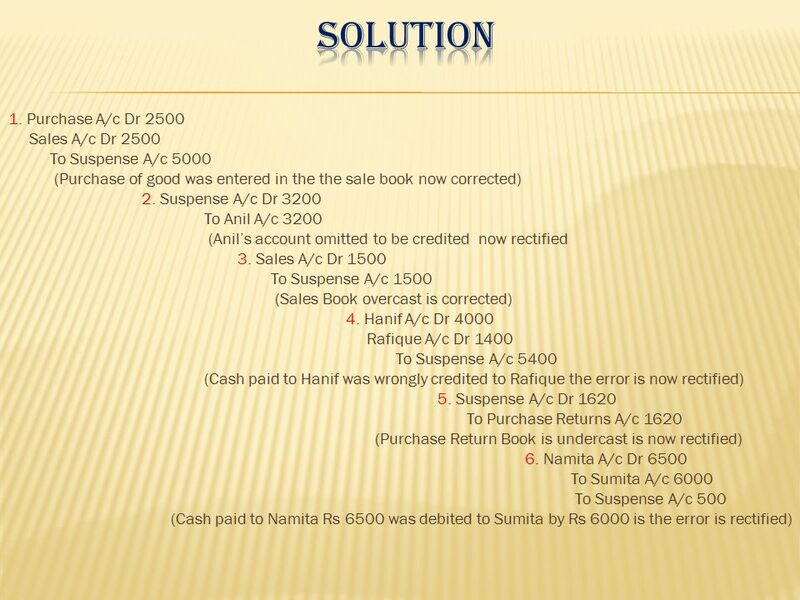 For example, Sales Book is overcast by Rs In this case only Sales A/c is wrongly credited by excess amount of Rs.1000 while the corresponding account of the various debtors have been correctly debited. 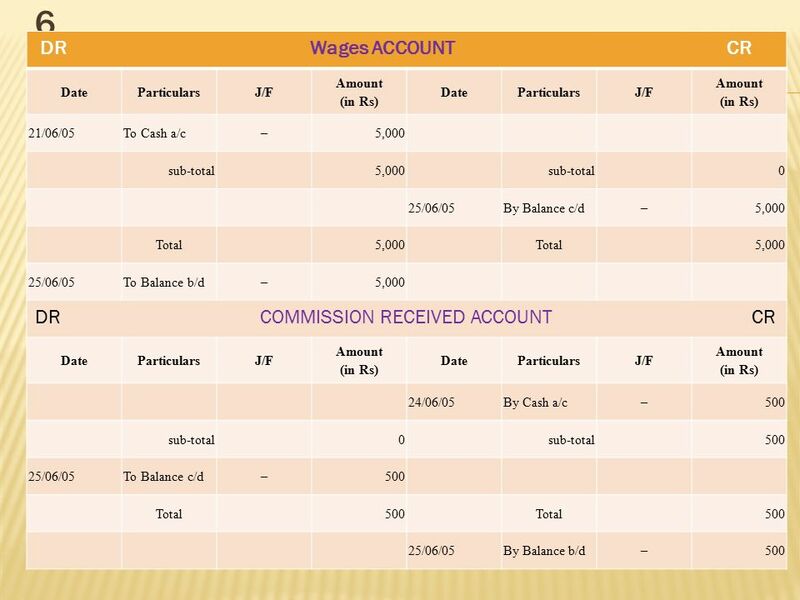 Another example of one sided error is Rs 2500 received from Ishita is wrongly debited to her account. 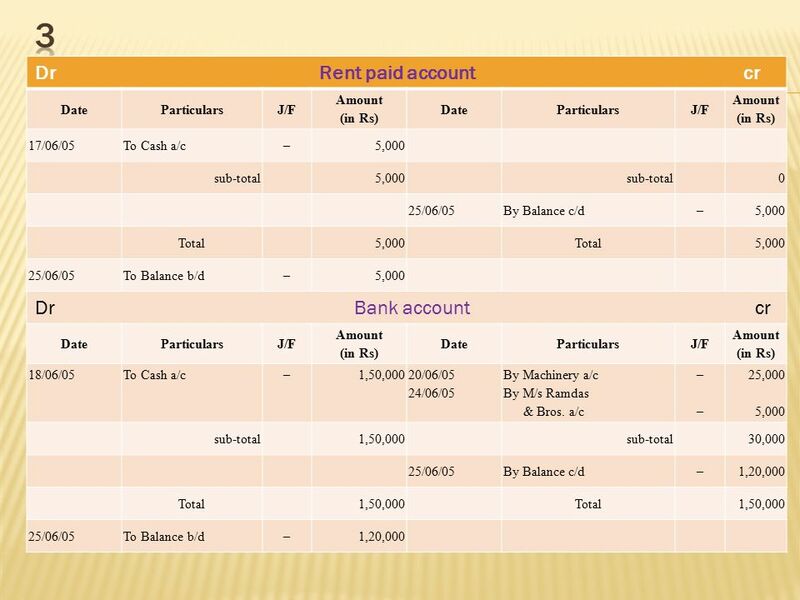 In this case, only Ishita’s account is affected, amount in the cash-book is correctly written. 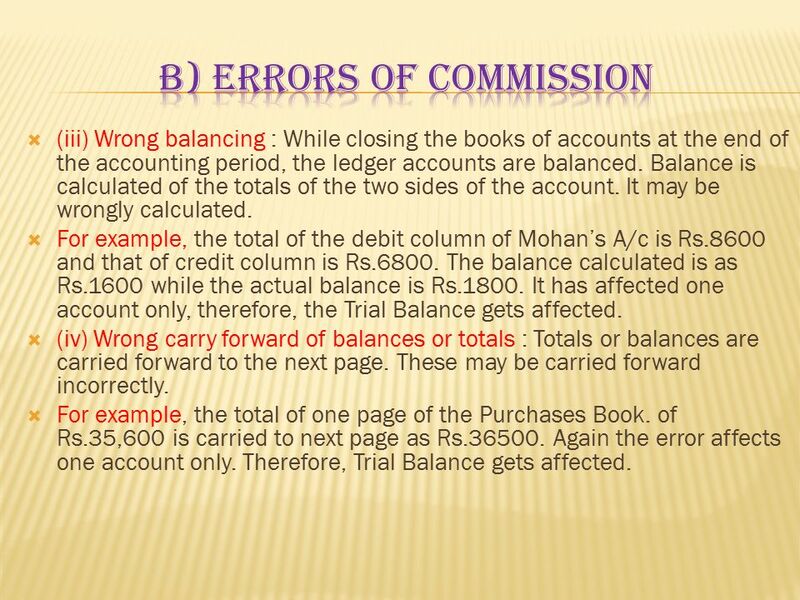 This type of mistake does affect the trial balance. 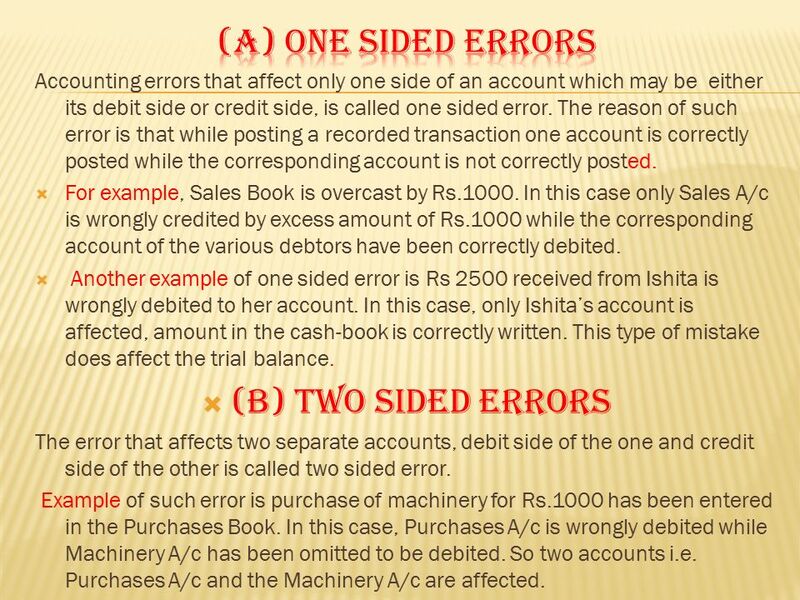 (B) TWO SIDED ERRORS The error that affects two separate accounts, debit side of the one and credit side of the other is called two sided error. Example of such error is purchase of machinery for Rs.1000 has been entered in the Purchases Book. In this case, Purchases A/c is wrongly debited while Machinery A/c has been omitted to be debited. So two accounts i.e. Purchases A/c and the Machinery A/c are affected. 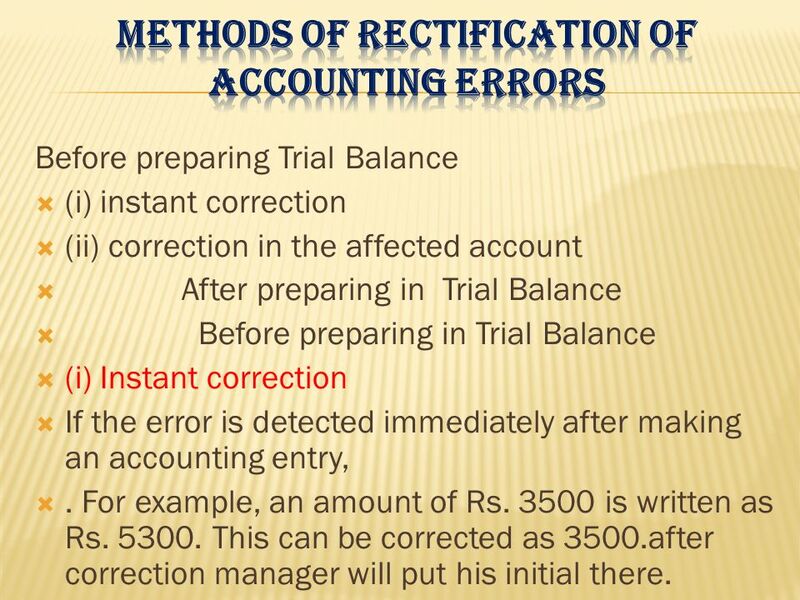 Before preparing Trial Balance (i) instant correction (ii) correction in the affected account After preparing in Trial Balance Before preparing in Trial Balance (i) Instant correction If the error is detected immediately after making an accounting entry, . For example, an amount of Rs is written as Rs This can be corrected as 3500.after correction manager will put his initial there. 47 (ii) Correction in the affected accounts. 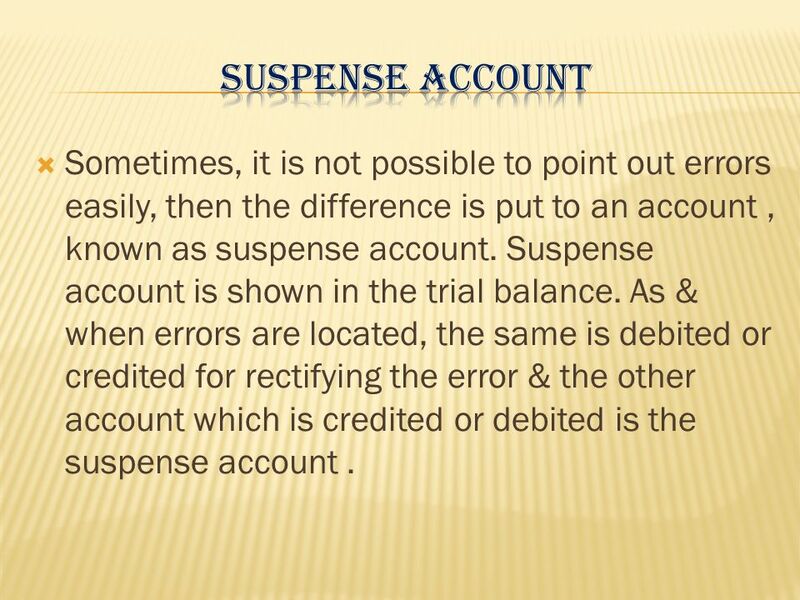 48 Suspense account Sometimes, it is not possible to point out errors easily, then the difference is put to an account , known as suspense account. 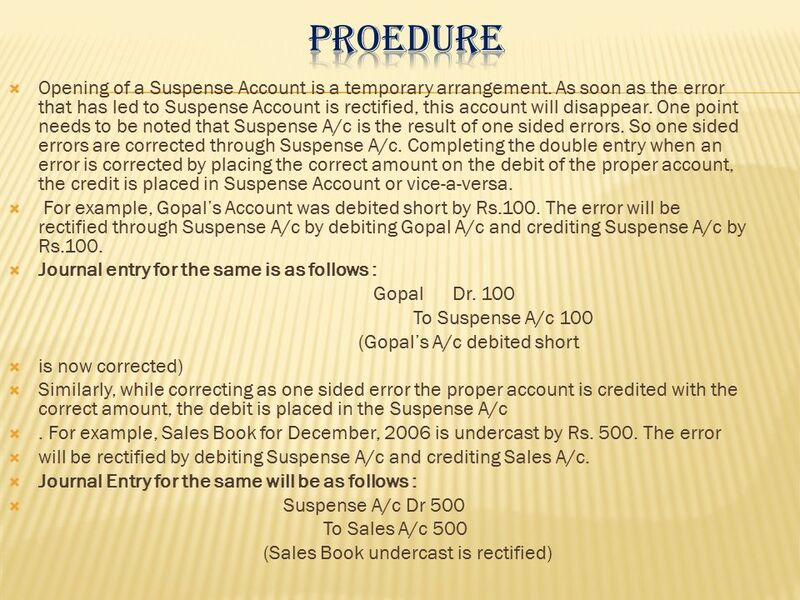 Suspense account is shown in the trial balance. 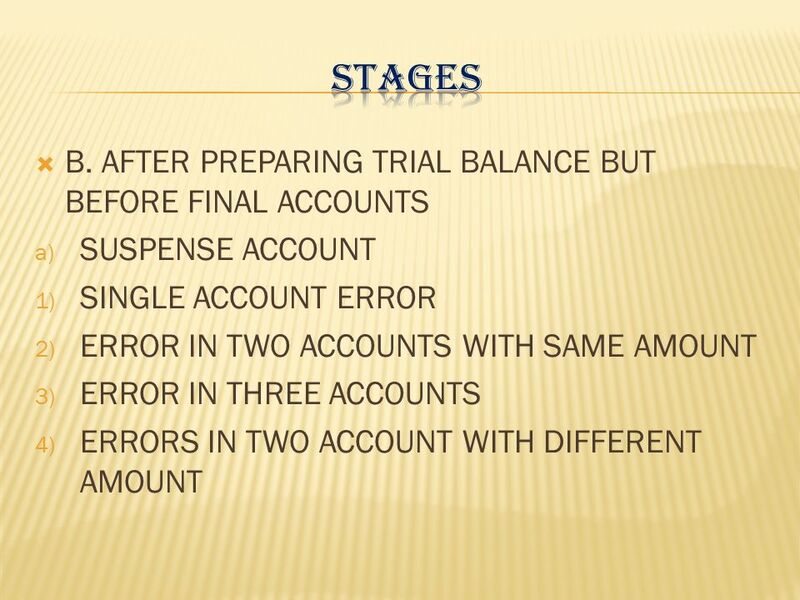 As & when errors are located, the same is debited or credited for rectifying the error & the other account which is credited or debited is the suspense account . 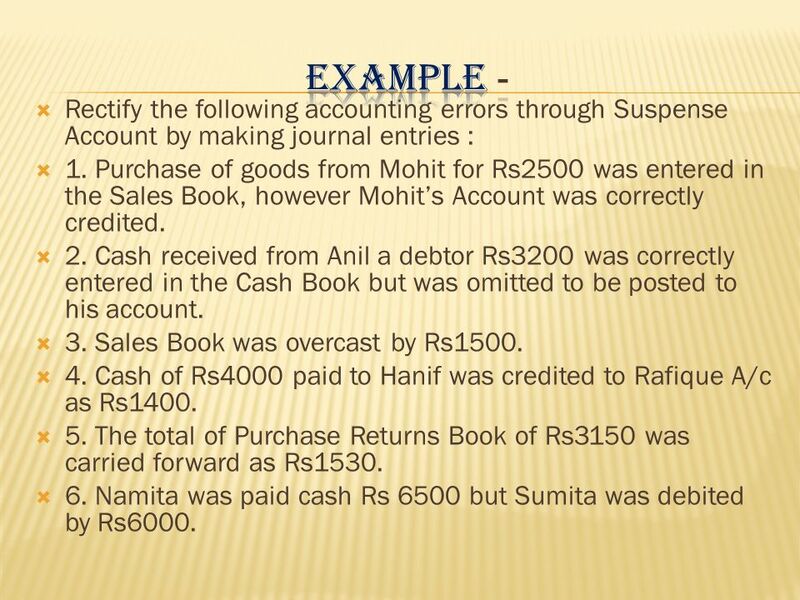 50 EXAMPLE - Rectify the following accounting errors through Suspense Account by making journal entries : 1. Purchase of goods from Mohit for Rs2500 was entered in the Sales Book, however Mohit’s Account was correctly credited. 2. Cash received from Anil a debtor Rs3200 was correctly entered in the Cash Book but was omitted to be posted to his account. 3. Sales Book was overcast by Rs1500. 4. Cash of Rs4000 paid to Hanif was credited to Rafique A/c as Rs1400. 5. The total of Purchase Returns Book of Rs3150 was carried forward as Rs1530. 6. Namita was paid cash Rs 6500 but Sumita was debited by Rs6000. 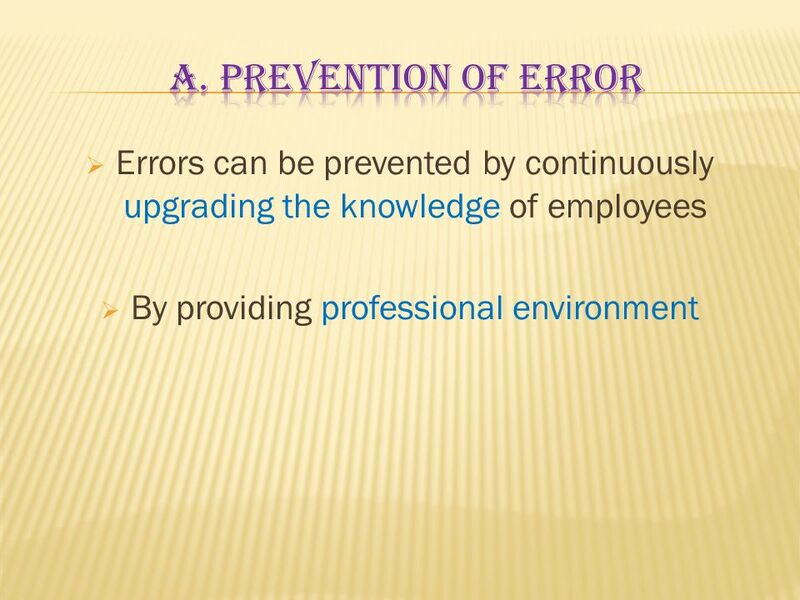 If the error/errors are there effect of such error would be either increase or decrease in the gross profit/ net profit. Both the account would not be correct, so it is necessary to rectify the error & arrive at the correct amount of profit. 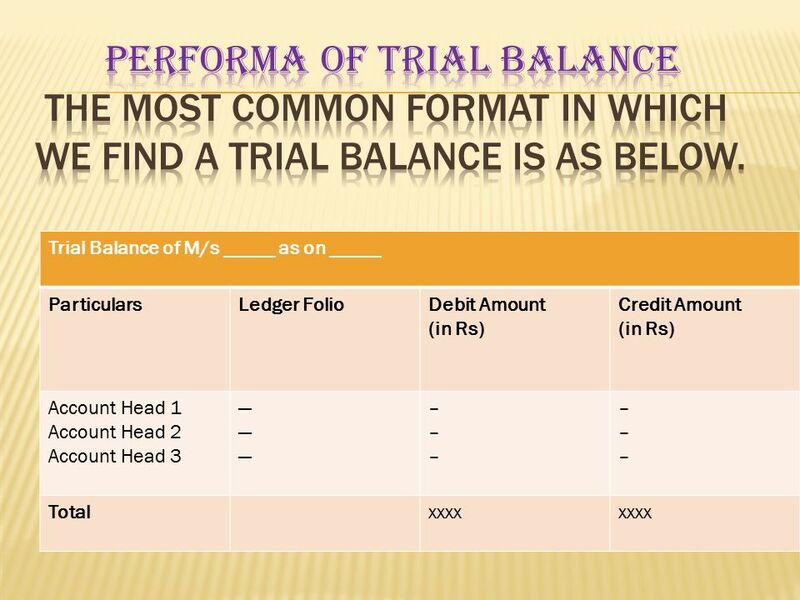 similarly balance sheet would also not be correct if some errors are there. 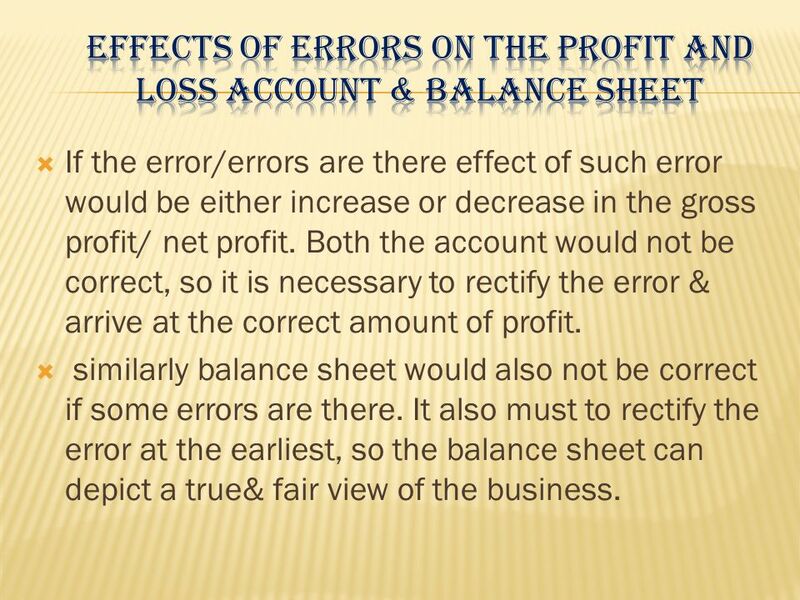 It also must to rectify the error at the earliest, so the balance sheet can depict a true& fair view of the business. 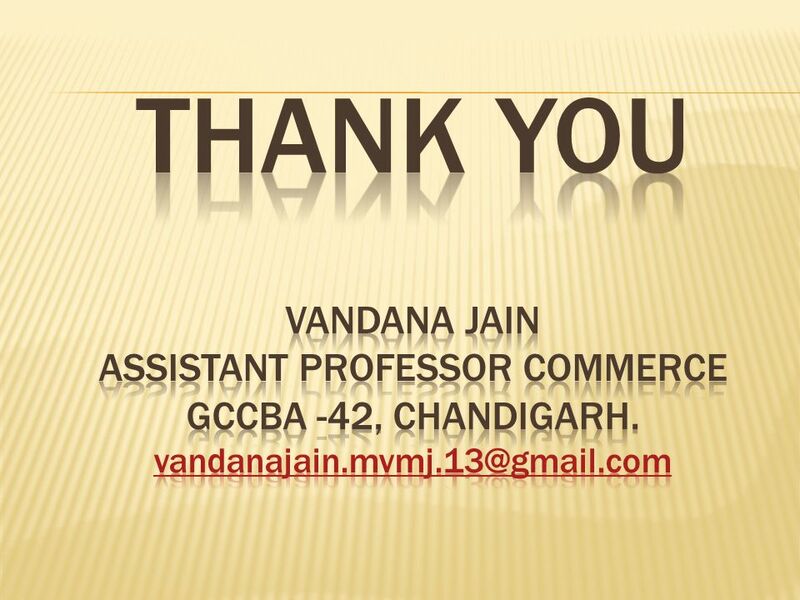 53 THANK YOU VANDANA JAIN ASSISTANT PROFESSOR COMMERCE gccba -42, Chandigarh. 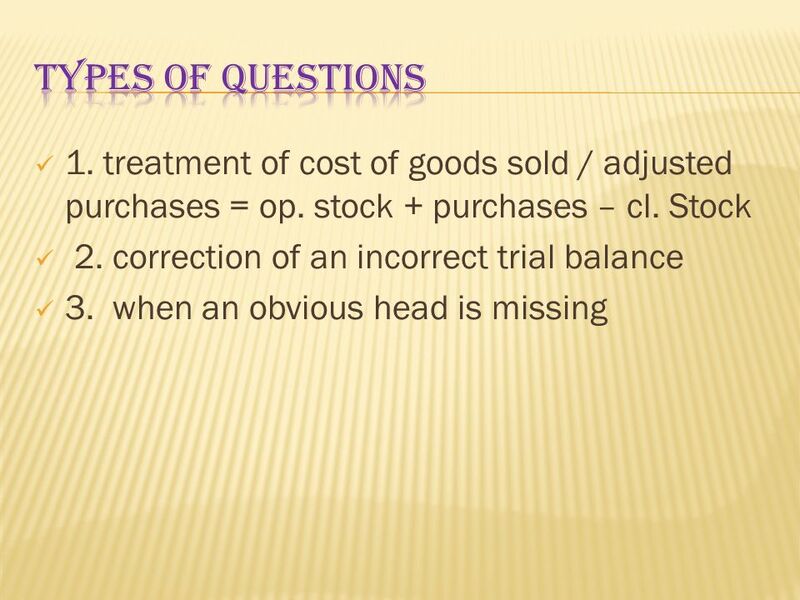 Download ppt "TRIAL BALANCE & RECTIFICATION OF ERROR"
AAT Level 2 Sales Ledger Control Accounts. Chapter 26 Errors Not Affecting Trial Balance Agreement. AS Accounting Unit 1 Past Examination Paper June 2009. 14/02/ Presentation on Double Entry System of Book keeping. JOURNAL A journal is a book in which transactions are recorded in the same order in which they occur, i.e., in a chronological order. A journal is called. Ledger  The book which contains accounts is known as the Ledger.  Transactions relating to a particular account for a given period are brought together. Ledger Account Samir K Mahajan. 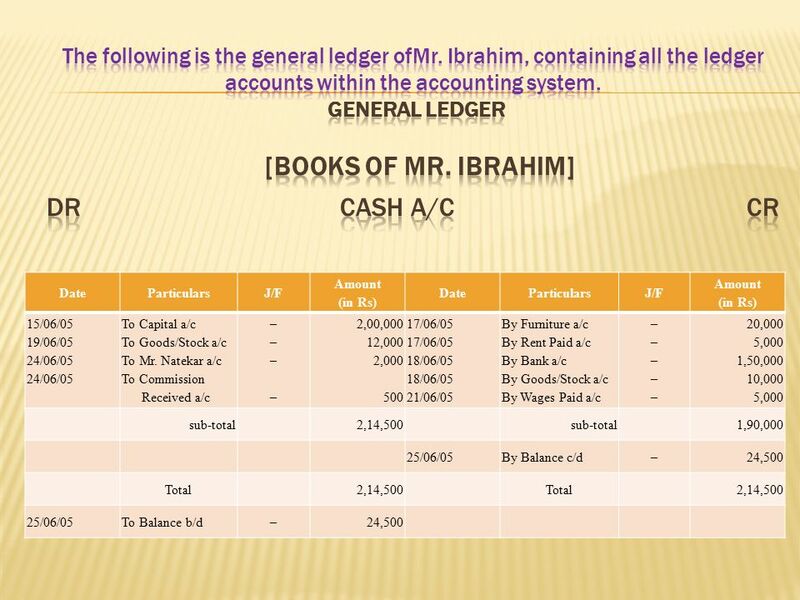 MEANING OF LEDGER ACCOUNT A Ledger is a book which contains all the accounts whether personal, real or nominal, which. FINANCIAL ACCOUNTING. TOPICS BASIC CONCEPTS BASIC CONCEPTS BANK RECONCILIATION BANK RECONCILIATION TRIAL BALANCE TRIAL BALANCE CAPITAL & REVENUE EXPENDITURE. Debit and credit balances guidelines Debit balance Cash account Purchases account Returns in Fixed asset accounts Expenses accounts Drawing accounts Debtor’s. 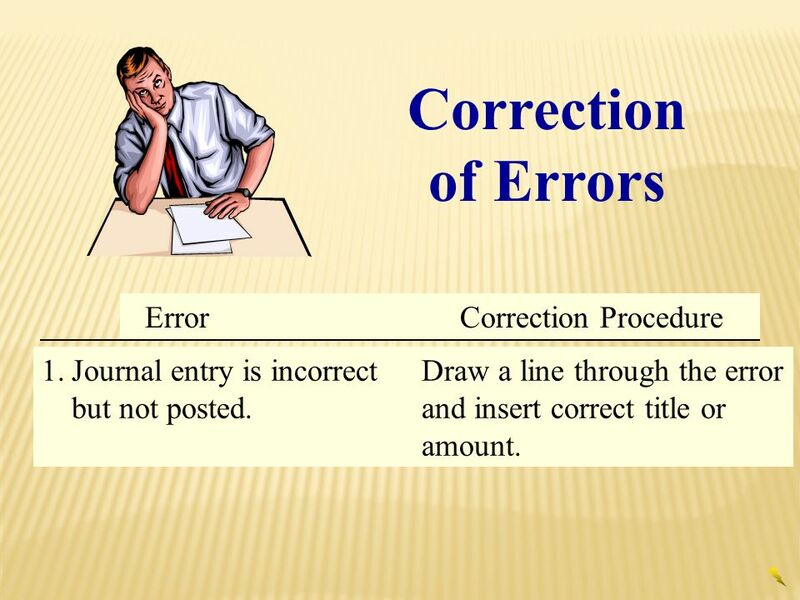 Unit 4C CORRECTION OF ERRORS. 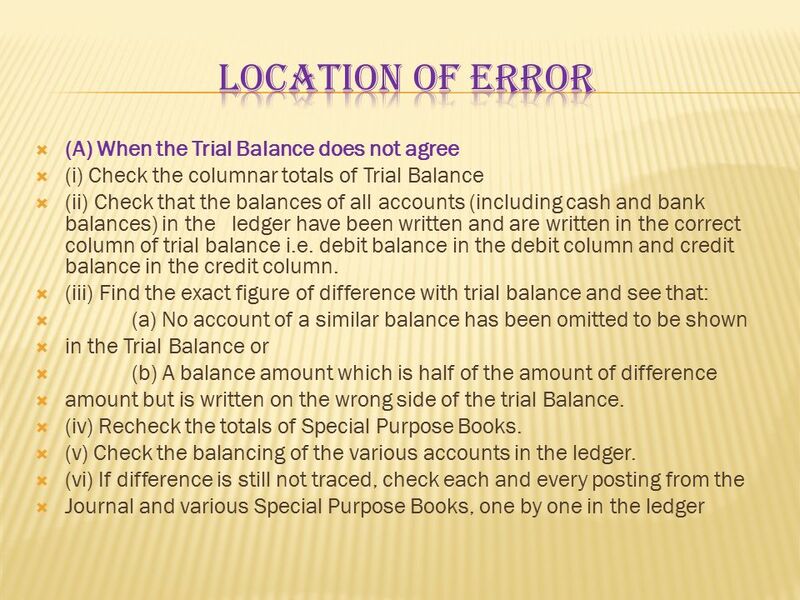 Errors not revealed by the Trial Balance The Trial Balance will not reveal any errors which have been made in both accounts. WHAT DO I DO IF I MADE A CARELESS MISTAKE IN MY MATHS PROBLEM SUM? WHAT DOES MY TEACHER DO WHEN HE MARKS A QUESTION WRONGLY? WHAT DOES THE CASHIER DO. 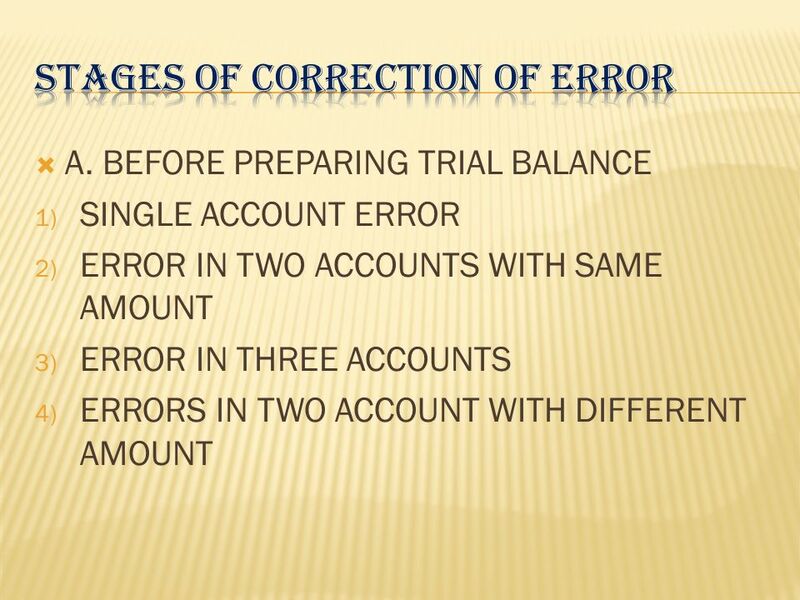 Correction of Errors in Control Accounts. 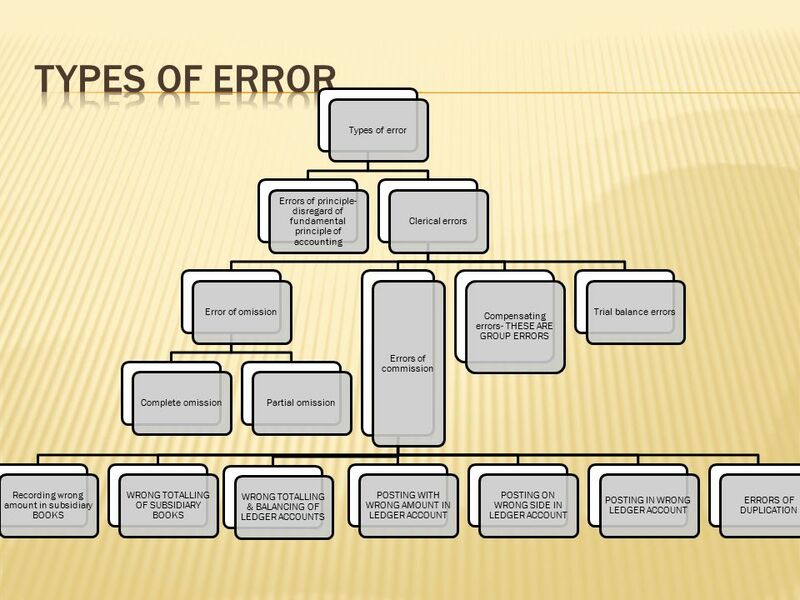 © Hodder Education 2008 How are errors identified in control accounts? Bookkeeping errors are more easily detected. 1 ACC102: FINANCIAL ACCOUNTING Week 3: Lecture 4.